Meta-analysis is used to determine if there are factors that systematically affect price and income elasticity estimates in studies of gasoline demand in the United States. Elasticity estimates from previous studies are used as the dependent variable with data characteristics, model structure, and estimation technique as the independent variables. Included among the explanatory variables a rejunctional form, lag structure, time span, and national setting (U.S. versus the U.S. pooled with other countries). Inclusion of vehicle ownership in gasoline demand studies is found to result in lower estimates of income elasticity, data sets which pool U.S. and foreign data result in larger (absolute) estimates of both price and income elasticity, and the small difference between static and dynamic models suggests that lagged responses to price or income changes are relatively short. This study also found that elasticity estimates appear relatively robust across estimation techniques. Proceedings - Gasoline prices, gasoline consumption, and new-vehicle fuel economy: Evidence for a large sample of countries. 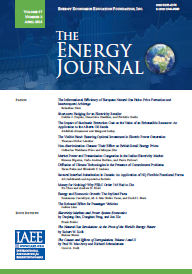 Published in Volume17, Number 3 of The Quarterly Journal of the IAEE's Energy Economics Education Foundation.